Day 1: It’s the very early morning of February 11, 2013, and, as you wipe the sleep from your eyes, you find yourself in the middle of the 5,500-acre Catalina State Park, deep in the Sonoran Desert of Arizona. The stark beauty of foothills, canyons and streams surround you, with the spectacular Santa Catalina Mountains serving as the backdrop to this vista. The landscape is studded with many stands of stately, silent saguaro cactus; in fact, the park has more than 5,000 of this icon of the Arizona desert. As with many digital photographers, who want to take advantage of this opportunity, but you’re not sure where to point your camera. You’re overwhelmed by exciting photographic compositions wherever you look, but you don’t want to bring home the visual clichés seen in so much desert photography. Fortunately, you made a wise decision, months earlier, to be one of just 10 digital photographers to join Visionary Wild’s advanced workshop, and benefit from the one-on-one instruction of two world-renowned photographers, Jack Dykinga and John Shaw. No one knows the southwest American desert better than Jack Dykinga, who has been photographing this astonishing landscape for three decades. His work has appeared in National Geographic and many other major publications and he has received a Pulitzer Prize for his unique combination of fine art photography and documentary photojournalism. John Shaw has been equally published and recognized for his 40 years of outstanding landscape imagery, which resulted in the North American Nature Photography Association (NANPA) honoring him with the first Outstanding Photographer Award during 1997. Justin Black, co-founder of Visionary Wild and a respected landscape/nature photographer, will also provide instruction and assistance, resulting in nearly a 3-to-1 ratio of instructors to students. During each early morning and late evening of the workshop, Jack will guide you through the creative/compositional process, so you’re able to see past the clichés and develop your unique vision and preserve it in your images. Day 2: During the midday heat, you’ll attend advanced classroom sessions with John Shaw, who will teach you how to link your field results with a workflow process that transposes your RAW images into fully expressed works of art. John will explain a comprehensive set of techniques, from processing RAW files to the many uses of metadata to creating panoramic photos. Day 3: During the early morning and late evening field sessions, Jack will help you take control of your emotional responses to the beauty of the Catalina State Park and channel them, technically and creatively, to capture successful compositions. Day 4: Following an enjoyable dinner with your fellow students and instructors, Jack and John will conduct detailed critique sessions to provide you with individual feedback that you can then apply during the evening shooting session. With confidence in the visual and technical skills that Jack Dykinga, John Shaw and Justin Black have shared with you for four days, this is the moment when it all comes together in a flash of heightened creativity. Day 5: In the low, dawn light, you will have another opportunity to pour all you’ve learned and experienced into the creative portion of your mind to achieve your lofty artistic goals. Jack, John and Justin will then conduct a final critique gathering, providing you with a few primary points to focus practice once you return home. A Visionary Wild Advanced Workshop is often so intensive and changes your photographic eye on a primal level that the lessons continue to help you grow as a digital photographer for years. 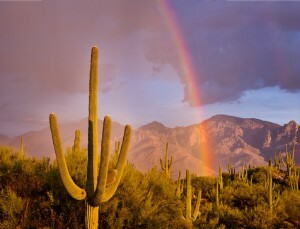 Visionary Wild’s Catalina State Park Arizona Workshop is limited to 10 photographers and is scheduled for February 11–15, 2013. For complete information and to register, click here.